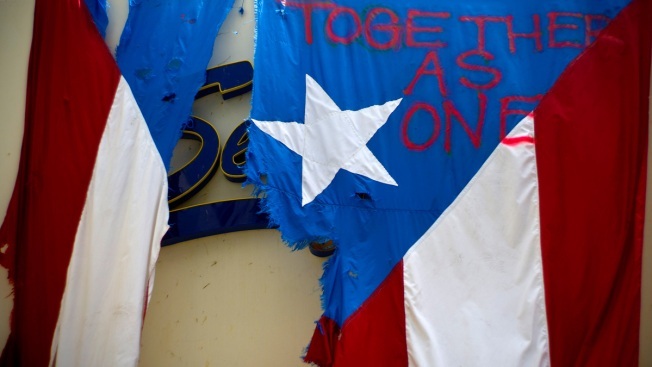 In this September 27, 2017 file photo, a damaged Puerto Rican national flag spray painted with the words "Together as One" hangs from the facade of a business, in San Juan, Puerto Rico, Wednesday, Sept. 27, 2017. The relief effort from Hurricane Maria in Puerto Rico has so far been concentrated largely in San Juan, and many outside the capital say they've received little or no help. Federal officials are blaming a lack of leadership, money and communication in Puerto Rico for setting back hurricane recovery efforts in the U.S. territory. FEMA Deputy Regional Administrator Ahsha Tribble said Thursday that the island's bureaucracy and the power company's inability to pay for supplies have slowed efforts to restore electricity. Nearly half a million power customers remain in the dark more than four months after Hurricane Maria. Energy experts also said that a lack of maintenance, heavily loaded lines and shoddy work done by Puerto Rico's power company contributed to the power grid's extensive failure after the hurricane. Officials spoke before a federal control board that oversees the island's finances and is considering a plan to privatize Puerto Rico's Electric Power Authority, which is $9 billion in debt.